A few days after the dramatic Kristallnacht - the night of terror unleashed by Goebbels against the German Jews - the front page of the French newspaper Paris Soir enthusiastically celebrated the Munich agreement with Hitler, which allowed Sudetenland's takeover while Europe turned a blind eye to the German domestic affairs. 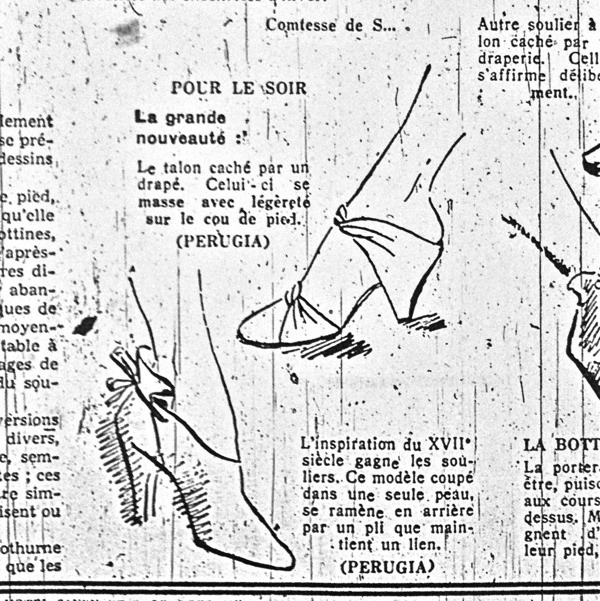 On a completely different note, on page 2 of the same daily, an ad announced the latest news by André Perugia : the draped heel. 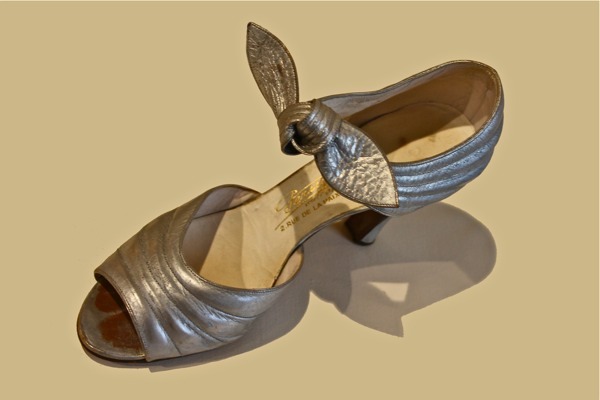 The model above belongs to the International Footwear Museum of Vigevano; another one is kept at the Musée International de la Chaussure, Romans. 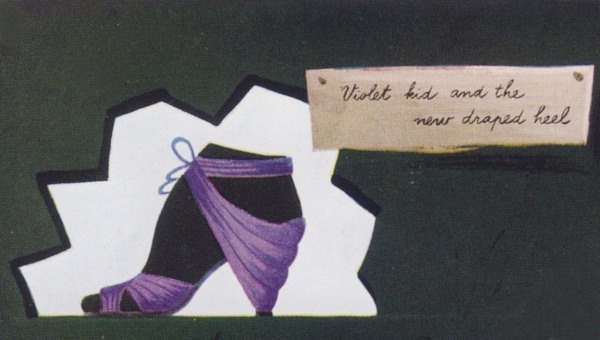 Thus spoke The New Yorker celebrating the US debut of the Schiaparelli collection (with Perugia shoes) in March of the following year. 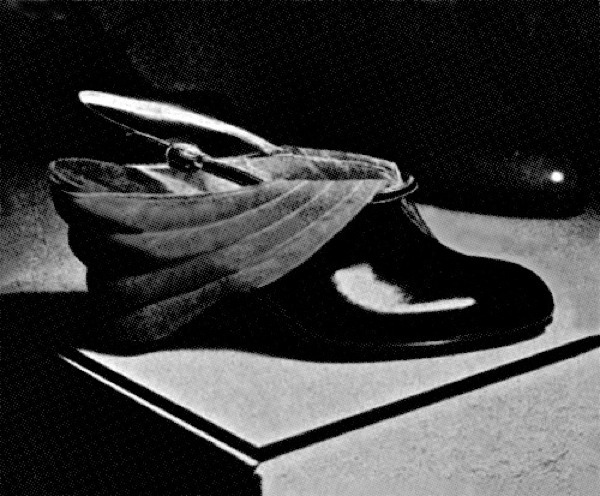 The draped heel existed at least in three adaptations: the one at the International Footwear Museum of Vigevano plus two for which only patents/drawings, or photos, survived. 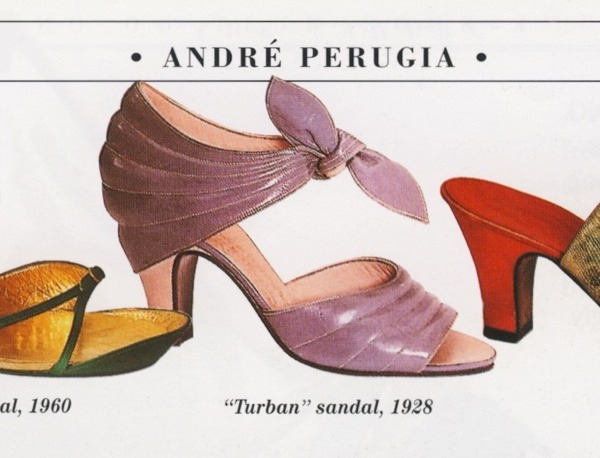 A new version of the draped heel below reappeared at the beginning of 1952 as part of a traveling exhibition of artistic Perugia shoes all over the United States from one I.Miller store to another. 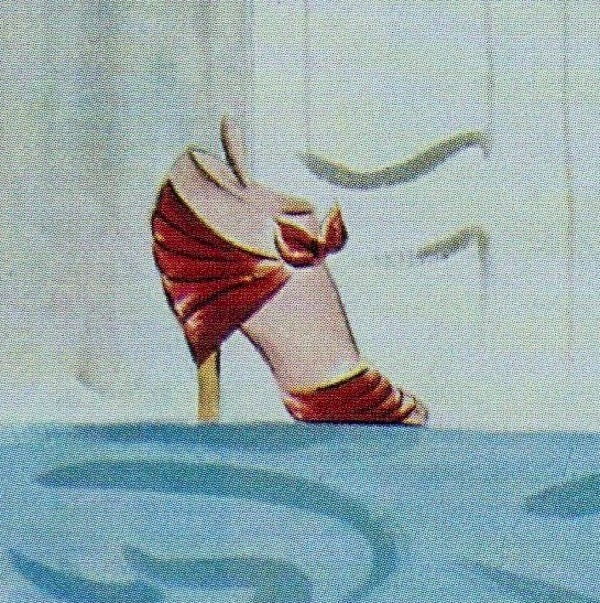 According to O'Keffe's Shoes: "(Perugia) transformed Josephine Baker's trademark turban into a quilted kidskin sandal, and he fashioned black lace heels for movie siren Gloria Swanson." It could be true - the turban, that is - however, the patents above amend the date (1928) and push it forward by ten years. Now, don't get the wrong impression: we like O'Keeffe's Shoes - it's a useful book - but we've been put on the wrong path so many times by wrong dates and inaccurate information that is embarrassing. Time for a revised edition. Pronto. 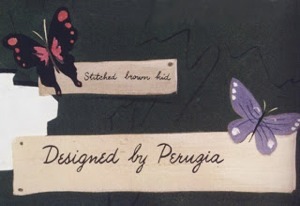 From: Shoes. A celebration of pumps, sandals, slippers & more.